When fuseproject partnered with Mission One to design a sustainable motorcycle, our goal was to create something iconic with a new, first-in-class motorcycle that would set the MISSION apart and make a statement all its own. “Riding the Wind” was the inspiration we had in mind early, imagining how it would feel to ride the MISSION. How could this concept be both effectively engineered and beautifully translated? The top portion of the motorcycle is an iconic continuous line that combines comfort and performance: the riderʼs chest is cradled in a convex tank area allowing a lower position, the seat and tail-light integrated into one lightweight dynamic line. Designed to express speed and efficiency in its overall sharp lines, the MISSION bike is highly detailed with special attention given to a rider’s needs, bringing a high level of product design and ergonomics to a new generation of performance transportation. Check out the exhibit for a unique perspective on the history and current state of the electric industry, as imagined through the vision of designers’ ultra-stylish, contemporary designs that point the way to the future. 1 Billion Uses + White Celebration! Fuseproject partner August, just announced that as of January 2019, users have locked/unlocked their doors more than one billion times with August! 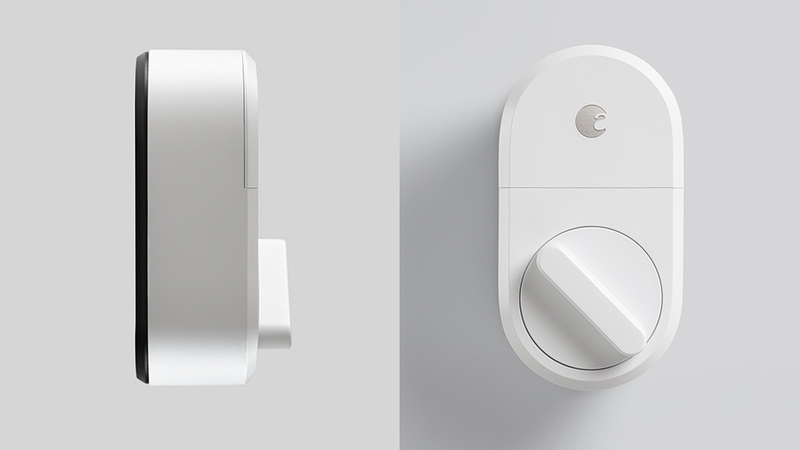 To celebrate this giant milestone, fuseproject designed the newest member of the August smart home family– the limited edition August Smart Lock in white. This new model is grounded in the same timeless design principles that have made August the #1 selling smart lock brand in the U.S.– simplicity, beauty and premium materials.Our new white Smart Lock design blends effortlessly with the most common door color– also white! August was co-founded by Yves Behar, and born out of fuseproject’s design venture program, which helps startups leverage the power of great design to bring “firsts” and category defining products to market. Fuseproject has driven design and innovation experience since the first August Smart Lock in 2013. Since then, numerous features and advanced solutions have been born from the collaboration: the August Doorbell cam, auto unlock, voice command unlocking, and the latest generations of August Smart Lock and Smart Lock Pro to name a few. We’re proud of our track record combining exceptional design with advanced technology to establish August as a leader in the growing smart home category…more to come! Scroll through the photos above and learn more about August here. What do Justin Timberlake, Scarlett Johansson, Ashton Kutcher, and Serena Williams have in common? They’re all new parents and happy owners of the SNOO, the world’s first smart bassinet– designed to respond to restless babies with calming sounds and movement that soothe them back to sleep. SNOO’s incredible success reflects the profound impact it has on the lives of families–and today we’re thrilled to share the news that SNOO will become even more accessible to parents across America. Starting January 9, 2019, parents will be able to rent SNOO for around $5/day. Finally, new parent exhaustion can be a thing of the past! At fuseproject we focus our energy on designing “firsts” and category leaders that change people’s lives for the better. Our most gratifying moments come when our partners and their products meet with such great success in the real world. SNOO epitomizes this, winning the hearts of well-rested parents while also winning more major awards than any baby product in history (including the Innovation of the Year award from the prestigious National Sleep Foundation). So it’s no surprise that this success has helped Happiest Baby, makers of the SNOO, reach another impressive milestone– they recently closed a $23M Series B Funding round led by Greycroft Partners. Congratulations Happiest Baby and we look forward to SNOO’s continued success. Cheers 2018, we have so much to celebrate! Another great year of exciting launches with our visionary partners who inspire us to bring ideas to life and change people’s lives for better. Thank you for giving us the opportunity to work on design that makes a difference and brings out the best in us. Best wishes for the year to come and happiest of holidays from fuseproject! When we were approached by the de Young Museum in San Francisco to create a permanent education gallery in the space, newly named the de Youngsters Studio, we were excited at the prospect of coming up with a new way to engage young people and spark their interest in art and design at such a crucial learning point in their lives. This is a space that offers kids and their caregivers a shared experience to interact, learn and play while absorbing five core artistic concepts: color, composition, shape & form, texture and sculpture. We see this as a unique opportunity to encourage interaction with multiple learning modules in a way that is both physical and leverages technology. And to reflect a museum’s ability to rotate exhibitions and keep the work on display fresh, our goal is to create a journey; one that inspires visitors to return and have a new experience each time. The result is an authentic and novel way for kids to understand the principles of art in an organic, inspiring setting, and open a dialogue among educators, young people and visitors alike. The space will be officially open to the public on December 1, 2018. A new area of investigation and creative problem solving is a unique opportunity, so I am eager to share the partnership with LivingHomes launching this weekend at Summit LA18 and previewed at NearFuture. This new foray into prefabricated and modular dwelling design comes from a passion for sustainable and efficient living, a passion I share with LivingHomes CEO Steve Glenn, who has been building modern and LEED platinum prefabs for over 10 years. In California, in cities like San Francisco and Los Angeles, there is a lack of urban stock and density which is an ongoing issue. A new law passed by governor Jerry Brown makes Accessory Dwelling Units (ADUs) a legal and encouraged option. This means that people are now able to have small and fully functional buildings in their backyards. This first foray into prefabricated and efficient living is an opportunity to think systematically about buildings, rather than as a one-size-fits-all solution. Every backyard is different, and every homeowner has the need for different light, privacy and building program choices. With this in mind, our YB1 ADU provides fully configurable interior layouts, with overall size, exterior and interior materials, and even flat or pitched roof variants. The structural system of YB1 allows for a wide range of internal layouts. Based on a 4’ grid that is full height, the homeowner can pick full height windows, clearstory or rigid walls all around the building. This makes the design responsive to the light, privacy and cost needs in a very precise and customized fashion. Constructed in LivingHomes’ efficient factory Plant Prefab in one month, the YB1 is installed in a day with all electrical (solar), plumbing, HVAC and appliances in place. The YB1 adheres to LivingHomes’ high environmental efficiency standards, and saves 70-80% of material waste compares to traditional construction. The YB1 ADU is also friendly to neighbors with such a short installation time: no more never ending construction project next door! It is anticipated that the prefabricated ADU market will grow substantially in the next decade as consumers seek additional living solutions, and cities seek to increase rental housing stock by making the process of adding small homes to existing properties more convenient. Together, our goal is to respond to this need in a novel way, and work on new manufacturing technologies that bring higher efficiency and lower costs over time. The YB1 is the first of a series of designs that will aim at providing beautiful, practical, sustainable and affordable solutions to the nascent ADU prefab market. Check out this interview with the New York Times to learn more about the project and stay tuned for continued collaborations with LivingHomes and PlantPrefab. Our five-year partnership with the UK’s leading smart home brand Hive is adding a third product to their home IOT line-up: the new outdoor security camera – Hive View Outdoor. We are excited to launch this new product, especially following the success and awards seen with both the Hive Active Heating thermostat and Hive View camera. Hive View Outdoor is the first outdoor security camera for the company with all of the elegance and intuitiveness of the original Hive View camera. When connected to other Hive devices, extra layers of smart security can be created using Hive Actions. Hive is continuing to position itself as a force in the smart home market, thanks to a cohesive line of products designed to work seamlessly together functionally and aesthetically. Through our design collaboration, we aspire to design technology in the home that is accessible, useful, discreet and elegant. We are excited to share an op-ed written by Yves Behar for the New York Times as part of a larger piece, “Five Artificial Intelligence Insiders in Their Own Words” which poses the question, what is the greatest promise of AI? Contributions to this important topic were given by Yves and other experts in the field, including Lila Ibrahim, Nils Gilman, Stephanie Dinkins, and Andrus Ansip, and it was an honor to bring up the point of view of design alongside their expertise. As designers that conceive new human experiences at fuseproject, we have embraced AI, robotics and smart environments as a way to deliver simpler and deeper experiences. We have adopted AI just as we would welcome any type of new material in our design practice, meaning we use AI as a tool. Yet it is a tool with many ramifications, both positive and negative. We have developed a sense of responsibility and a few principles even, which emerged through a number of projects over the years. From Happiest Baby Snoo for tired parents, to ElliQ and Seismic for the aging’s mind and body, Ori’s robotic furniture and August’s smart locks for homes, we now believe that a humanistic perspective in designing and conceiving with AI will allow this impactful technology to do good for all.